Photo taken at Secret Beach in the Samuel Boardman Scenic Corridor. Samuel Boardman State Park and Scenic Corridor is located on the Southern Oregon Coast. 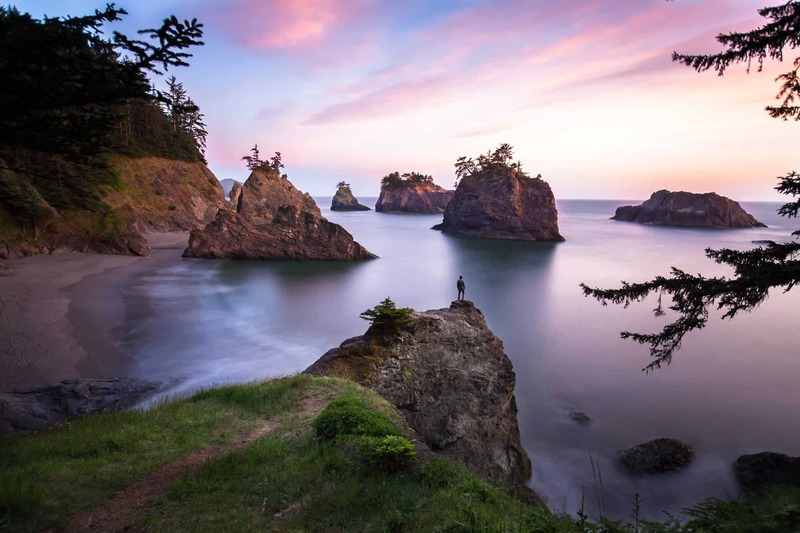 A few miles South of Gold Beach and North of Brookings, Samuel Boardman features some of the most beautiful coastline in the entire Pacific Northwest including dozens of different beaches and viewpoints. The Morrisey Productions crew recently embarked on road trip to capture footage with our new DJI Inspire Raw 4k Drone. We also recently acquired a new wide angle lens for our Cannon 5D camera that we wanted to test out as well. Our adventure began in Medford Oregon where we captured some breathtaking footage of the Table Rocks. This location is just outside of Medford and steeped with lore due to the fact that a giant battle with Native American Indians took place on top of the flat rock bluff. From there we traveled West down the Redwoods Highway and through Jedidiah Smith State Park until we ended up on the Northern tip of the California Coast. After a brief pause to check the surf in Crescent City, we started traveling north up Highway 101 until we reached the Samuel Boardman Scenic Corridor. This area is without a doubt one of the most scenic areas I have ever scene, in fact, the beach in which this photo was taken is one of my all time favorite places on earth. Known to some as “secret beach” this location is about a 1.5 mile hike from the road and is well worth the trip. While at Samuel Boardman State Park we were able to catch some amazing drone aerial footage that we will release at some point in the future. Check out our previous Oregon Coast video to see a sample of our work. Follow Morrisey Productions on Facebook to stay connected!